One of the most popular and influential gospel groups of the 20th century, the Soul Stirrers were pioneers in the development of the quartet style of gospel and, without intending it, in the creation of soul music, doo wop, and motown sound, some of the secular music that owed much to gospel. The group was formed by Roy Crain, who had launched his first quartet, which sang in a jubilee style, in 1926 in Trinity, Texas. In the early 1930s, after Crain moved to Houston, he joined an existing group on the condition that it change its name to "the Soul Stirrers." The name "Soul Stirrers" yields from the description of one of Roy Crain's earlier quartets as "soul-stirring". Among the members of that group was R.H. Harris, who soon became its musical leader. The Soul Stirrers formed as a Jubilee quartet, transformed their sound, influenced by many hard gospel singers such as Mahalia Jackson and Sister Rosetta Tharpe. Rebert Harris, also from Trinity, Texas, brought several changes to the Soul Stirrers that affected gospel quartet singing generally. He used a falsetto style that had its antecedents in African music, but which was new to the popular jubilee singing style of the time. He pioneered the "swing lead", in which two singers would share the job of leading the song, allowing virtuoso singers to increase the emotional intensity of the song as the lead passed between them without disturbing the four part harmony. That innovation led the Soul Stirrers, while still called a quartet, to acquire five members; later groups would have as many as seven but still consider themselves "quartets", which referred more to their style than their number. Learn about The Soul Stirrers. The Soul Stirrers made other important changes in those years: ad-libbing lyrics, singing in delayed time, and repeating words in the background as both a rhythmic and emotional support for the lead singers. The Soul Stirrers along with other quartet performers, dropped the "flatfooted" style of jubilee quartets before them and expanded their repertoire from spirituals and traditional hymns to the newer gospel compositions. The group also loosened the rigid arrangements that jubilee quartets had favored to permit individual singers within the group more space for individual development. In 1936 Alan Lomax recorded the Soul Stirrers for the Library of Congress 's American music project under the Aladdin Record label. They later moved to Chicago, where they broadcast a weekly radio show (WIND) with other famous groups including Golden Gate Quartet, and The Famous Blue Jay Singers. As the gospel quartet style of singing became more popular, groups would perform in competitions called "song battles" to further increase the genre's popularity. As World War II began, it became more difficult for many gospel quartet groups to make a living. This resulted in many quartets making a living by doing "live performances at churches, schools and neighborhood centers," (Rubin). Despite the economic situation, throughout the 40's and leading into the 50's, many gospel quartet groups were able to pursue their careers successfully. The Soul Stirrer's nationwide touring gained them an even larger audience, as they delivered the emotional fervor that popular jubilee groups, such as The Golden Gate Quartet, did not. The Soul Stirrers signed with Specialty Records, where they recorded a number of tracks, including "By and By" and "In that Awful Hour". Harris, the most popular member of the group, soon quit, however, in order to form a new group. He was briefly replaced on lead by Paul Foster, then by the unknown Sam Cooke. In retrospect, Sam Cooke seems like a perfect and obvious replacement for Harris, but he had some pretty big shoes to fill. Sam worked hard to emulate Harris's vocal style. Harris claims to have spent time training Sam Cooke to be his replacement but this is debated by several sources. Under Sam Cooke, The Soul Stirrers underwent a change of image: Cooke was young and had a more sexual presence onstage. Sam Cooke was "the first singer to bring a younger crowd as well as the older shouting saints," (Heilbut). One of the first singles with Cooke was "Jesus Gave Me Water", a major hit that brought the Soul Stirrers massive acclaim. Thomas L. Breuster was replaced by Bob King and, briefly, Julius Cheeks. 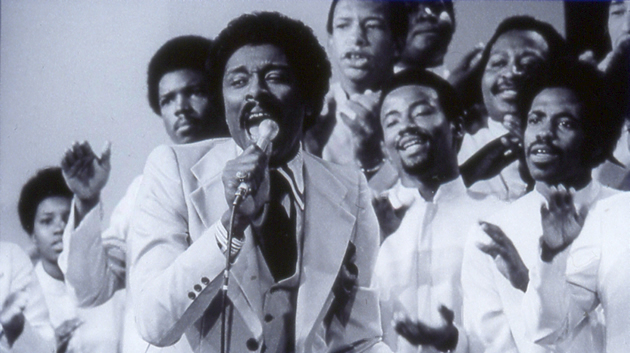 When Cooke left in 1957 to pursue a career in pop music, the Soul Stirrers' preeminence in gospel was essentially over, though a brief period of success with Johnnie Taylor (an effective mimic of Cooke) sustained the group for a time. Various line-ups continued touring and recording throughout the last half of the century to a small and devoted following. The group — and all of its members — was inducted into the Rock and Roll Hall of Fame in 1989 as one of rock's Early Influences, and into the Vocal Group Hall of Fame in 2000. The family began appearing in Chicago-area churches in 1948, and signed their first professional contract in 1952. During their early career they recorded in an acoustic gospel-folk style with various labels: United Records, Vee-Jay Records, Checker Records, Riverside Records, and then Epic Records in 1965. While the family surname is "Staples", the group used the singular form for its name, resulting in the group's name being "The Staple Singers". Learn about the Staple Singers. It was on Epic that the Staple Singers began moving into mainstream pop markets, with "Why (Am I Treated So Bad)" and "For What It's Worth" (Stephen Stills) in 1967. In 1968, the Staple Singers signed to Stax Records and released two albums with Steve Cropper and Booker T & the MG's — Soul Folk in Action and We'll Get Over . By 1970, Al Bell had become producer, and with Engineer Terry Manning, the family began recording at the famed Muscle Shoals Sound Studio, and Memphis' Ardent Studios, moving in a more funk and soul direction. The first Stax hit was "Heavy Makes You Happy (Sha-Na-Boom Boom)". 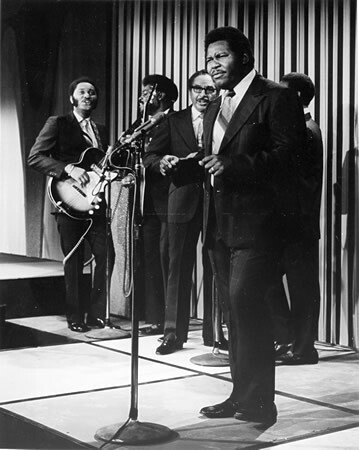 Their 1971 recording of "Respect Yourself", written by Luther Ingram and Mack Rice, peaked at number 2 on the R&B charts and was a number 12 pop hit as well. The song's theme of self-empowerment had universal appeal, released in the period immediately following the intense American civil rights movement of the 1960s. In 1972, the group had a huge No. 1 hit in the United States with "I'll Take You There". It topped both pop and R&B charts. "If You're Ready (Come Go With Me)" would become another big hit, reaching number 9 pop and number 1 on the R&B chart in 1973. Then, after Stax's bankruptcy in 1975, they signed to Curtis Mayfield's label, Curtom Records, and released "Let's Do It Again", produced by Mayfield; the song became their second No. 1 pop hit in the US. In 1976, they collaborated with The Band on the song "The Weight" for their film The Last Waltz . However, they were not able to regain their momentum, releasing only occasional minor hits. Their 1984 album Turning Point featured their final Top 40 hit, a cover of Talking Heads' "Slippery People" (which also reached the Top 5 on the Dance chart). In 1994, they again performed the song "The Weight" with Country music artist Marty Stuart for MCA Nashville's Rhythm, Country and Blues compilation, somewhat re-establishing an audience. The song "Respect Yourself" was used by Spike Lee in the soundtrack to his movie Crooklyn , made in 1994. Jubilee Showcase. Click to watch video. In 1999, the group was inducted into the Rock and Roll Hall of Fame. Pops Staples died of complications from a concussion suffered in December 2000. In 2005, the group was awarded the Grammy Lifetime Achievement Award. Mavis Staples has continued to carry on the family tradition and continues to add her vocal talents to both the projects of other artists and her own solo ventures. Born in San Antonio, Texas, Jessy sang and played his first song at the age of five. As a youngster he moved to Chicago, Illinois, where he was heard and discovered by James Cleveland, who was one of the first artists to sing and record Jessy Dixon's compositions, "God Can Do Anything But Fail," and "My God Can Make A Way." The organizers of the Newport Jazz Festival invited him to perform his new song, "The Wicked Shall Cease Their Troubling," at New York's Radio City Music Hall in 1972. After the performance, Jessy and The Jessy Dixon Singers were requested to do four encores. Paul Simon, of Simon and Garfunkel, was in the audience and invited Jessy to share the stage with him as lead vocalist on NBC-TV's Saturday Night Live . Not only did they share that performance, Jessy soon found himself touring with Simon across the United States, France, Europe, Canada, Scandinavia, Israel, and Japan. Jessy's affiliation with Paul Simon lasted for eight years, during which time he recorded two albums, Live Rhymin (1974) and Still Crazy After All These Years (1975), both of which sold a million copies. "Jessy has a rare and joyous musical gift. I have loved gospel music and during the years I have been associated with Jessy my appreciation of the gospel has grown." 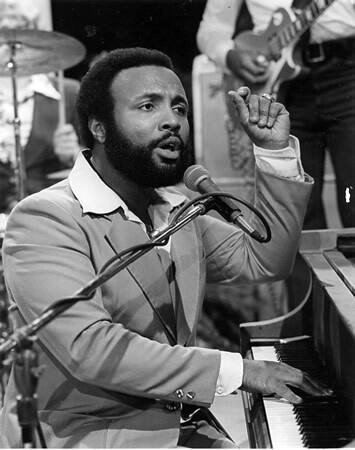 Songwriter and producer, Andrae Crouch also recognized the magnitude of Jessy's talent, and produced Jessy Dixon's classic recording, "It's All Right Now." Many of Jessy's award-winning compositions have been sung and recorded by such artists as Amy Grant, Sandi Patty, Cher, Natalie Cole, Diana Ross, Danniebelle, Point Of Grace, Walter Hawkins, Randy Crawford, The Thompson Community Singers, James Cleveland, among others. In 1993, Jessy Dixon composed "I Am Redeemed." It remained in the top ten gospel music charts for an unprecedented five years. The years Jessy has spent writing, singing, and producing have enabled him to realize the abiding dream of demolishing the walls dividing cultural musical styles. A few years ago, Jessy found two allies who shared his dream. Bill and Gloria Gaither invited him to sing at a Homecoming video taping and provided him yet another opportunity to see his dream become a reality. "Christian music isn't just one style," says Bill Gaither, "It's a theology wrapped up in a lot of different styles..." Jessy has played an important role in the unifying quality of the Homecoming video series. Dixon is now a favorite on the series, and has traveled all over the United States and abroad surprising gospel audiences with his stirring performances of "It's A Highway To Heaven," "Operator," "Leaving On My Mind," "Blood Bought Church," "The Wicked Shall Cease Their Troubling," "Lord Prepare Me To Be A Sanctuary," and "I Am Redeemed." In addition to his current involvement with the Homecoming videos and concerts, his own concert schedule includes concerts both in America and abroad. He tours Europe four to six months each year, and performs the hit Broadway show, Black Nativity with The Jessy Dixon Theater Group . Jessy is also an ordained minister with Calvary Ministries International of Fort Wayne, Indiana. Showcase influenced gospel music. Click to watch video. The words printed in the International Herald Tribune summarize the Jessy Dixon experience: "No where else in the world will you find such a delightful, pure, and honest performance, ingeniously combining brilliant vocalizing and high energy excitement, as when you listen to Jessy Dixon. When your feet begin to tap with the beat, the desire to get up and dance becomes overwhelming, and maybe a tear comes to your eyes; that is when Jessy Dixon's performance has reached its pinnacle." The list of musicians that he has worked with include Paul Simon, Andrae Crouch, DeGarmo & Key and most recently Bill Gaither in the Homecoming series of concerts. He has written songs for Amy Grant, Natalie Cole, Cher, and Diana Ross. Inez Washgiton Andrews In 1957, Andrews became a member of the gospel group The Caravans; she auditioned for Albertina Walker (Queen Of Gospel Music) and Dorothy Norwood, and they sent for her in Chicago. She has resided there, and used Chicago as a base for her performing career, to this day. Along with Albertina Walker, Dorothy Norwood, James Cleveland, Shirley Caesar, Cassietta George, Josephine Howard, Eddie Williams, James Herndon, and Delores Washington, she became one of the major stars of gospel's golden age. The Caravans produced songs such as "Lord Keep Me Day By Day", "Remember Me," "I Won't Be Back," and several other hits in which Andrews was lead vocalist, including "Mary Don't You Weep," "I'm Not Tired Yet," "Make It In," "He Won't Deny Me," and "I'm Willing". She has also released a reunion album with The Caravans, Albertina Walker, Dorothy Norwood, and original soprano Delores Washington, entitled Paved the Way. After a stellar career with the Caravans, she left the group in 1962 and had huge success with her crossover hit, "Lord Don't Move the Mountain". Andrews has recorded on many labels since the 1950s and has many albums and hit songs to her credit, some of which she composed herself. She is a dedicated Christian and family person and raised seven children during her career in gospel music. In 2002, she was inducted into the Gospel Hall of Fame. Crouch's first group was the Church of God in Christ Singers (COGICS) in 1960, which included Billy Preston. The COGICS were the first group to record the song "The Blood Will Never Lose Its Power." 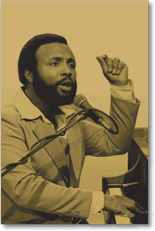 Andrae Crouch — Grammy Award winner & Gospel Hall Of Fame memberClick to watch video. While attending Valley Junior College in California for a career in teaching, he was called to the ministry and formed The Disciples in 1965, along with Perry Morgan, and Bili Thedford. The group became a frequent attraction at "Monday Night Sing" concerts in southern California put on by promoter Audrey Meier. Meier would introduce Crouch to Tim Spencer of Manna Music Publishing who would be the first to publish one of his songs ("The Blood Will Never Lose Its Power" which was written by Andrae at age 15 but tossed in the trash because he thought it poor. Sister Sandra thought differently and salvaged it.) In turn, Spencer helped launch their recording career by introducing the group to Light Records founder Ralph Carmichael. Sherman Andrus and Reuben Fernandez were added to the group in time to record their first album, Take The Message Everywhere , in 1968. They were subsequently replaced by Andrae's twin sister Sandra in 1970. Sherman Andrus went on to join the Imperials. 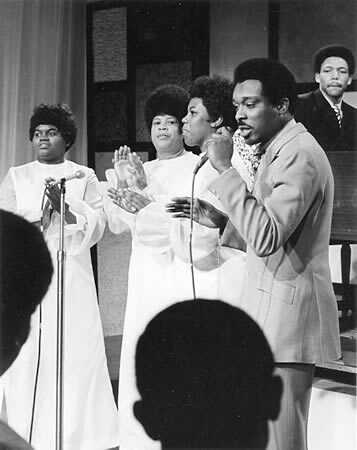 In 1972, singer Danniebelle Hall, trumpeter Fletch Wiley, Harlan Rogers and drummer Bill Maxwell joined the Disciples. Many support singers, Kathy Hazzard, Bea Carr, and James Felix were part of the Disciples entourage. Bili Thedford and Danniebelle left for a solo careers. 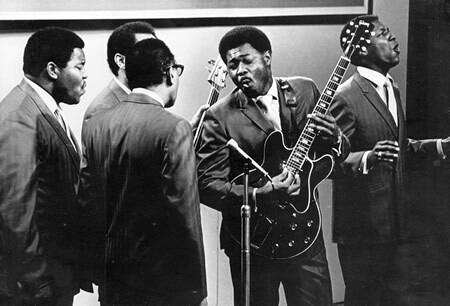 At the urging of Carmichael, Crouch began to record his compositions in 1968 with the group's debut album Take the Message Everywhere releasing in 1969. In 1972, the Disciples appeared on network television's The Tonight Show Starring Johnny Carson . By 1985, they had also performed at the Hollywood Bowl and Carnegie Hall and toured 68 countries. Crouch's most popular songs from this period include "The Blood Will Never Lose Its Power," "Through It All," "Bless His Holy Name" and "My Tribute". Their contemporary gospel sound reached beyond the traditional African American base and touched a racially and musically diverse audience. The Disciples disbanded in 1979 and Andrae' continued on with his solo career with an ensemble Howard Smith, Linda McCrary, Tata Vega and Kristle Murden as well as with the Andrae' Crouch Singers. Joe Sample, Wilton Felder, Dean Parks, David Porcaro, Phillip Bailey, Stevie Wonder other secular artists were featured on all of Crouch's major recording sessions. Crouch had a gift of bringing out unique voices in solos on his projects including El Debarge on "The Lord is my Light" or Tata Vega on "Oh it is Jesus". He has produced solo projects for Kristle Murden and James Felix. Several musical acts and solo performers covered his more popular works, including Elvis Presley, further expanding Crouch's musical influence. In 2006, Crouch released Mighty Wind , a 40th anniversary album featuring guest performances by Marvin Winans, Crystal Lewis, Karen Clark Sheard, and Lauren Evans. In 1996, Crouch's songs were the impetus for the Grammy Award- winning CD, Tribute: The Songs of Andraé Crouch (released on Warner Bros. Records), which featured a range of artists performing some of his classic songs including , the Brooklyn Tabernacle Choir, Take 6 and Michael W. Smith. Andraé and his sister, Sandra considered Michael Jackson as a dear friend for many years, whom they loved and greatly respected. In 1987, the Andraé Crouch Choir sang background vocals along with Siedah Garrett, Glen Ballard, and The Winans on Jackson's hit single, "Man in the Mirror" from the Bad album. The Andraé Crouch Singers were also featured on the songs, "Keep the Faith" and "Will You Be There" from Jackson's 1991 Dangerous album. Andraé and Sandra also did the choir arrangement for those songs. On Jackson's HIStory: Past, Present and Future, Book I project in 1995, the Andraé Crouch Choir chants climacticly in a dramatic interaction with Jackson on "Earth Song." Crouch's composition, "Soon and Very Soon" was performed at the public memorial service for Jackson at the Staples Center in Los Angeles.